This is Henrietta, and as you can see here, she was feeling a little sad thanks to a shredded tire. She was also in desperate need of a wash, but that's a story for another day. 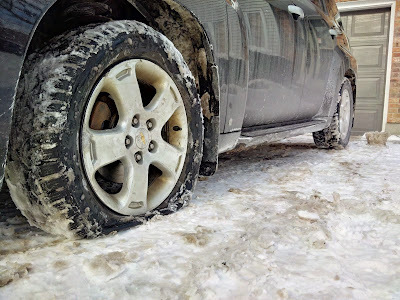 My little tire adventure - it ultimately needed to be replaced, because apparently driving on flattened rubber isn't recommended - gave me a lesson in perspective. As annoying as it was to have to call the auto club, then pay for a new tire, then spend a chunk of my weekend getting everything taken care of, I realize it could have been a lot worse. If a flat tire in my driveway is as bad as it gets, then I really have nothing to complain about. Others have much more substantial issues to worry about. And fixing what ails them is a lot tougher than simply calling the auto club and ordering a new tire. I'll keep that in mind the next time I feel like whining about the little annoyances of modern life that drop themselves onto our calendars with troubling regularity. It could always be much worse.